At this time of year that I usually provide you with a report on how the Got Matar Community Development Group has made use of your gifts. It is also a time to thank you for your help. What you have given has been wisely and efficiently managed and has already made a huge difference to the livelihood prospects of hundreds of children. Progress continues to be very satisfactory. The best measure of success is the performance of the school’s final year pupils in the Kenya Certificate of Secondary Education (KCSE) exams. In 2011, 93 pupils sat the exam, and the school ranked 10th out of the 25 secondary schools in Bondo District, up from 15th in 2010. At least 12 former students are now studying at various universities in Kenya, 6 are at teacher training colleges, and one has completed officer training and is a member of the police force. 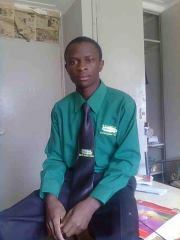 Tom Owino (pictured here) is a former bursary holder who scored the top marks at Got Matar in the 2010 KCSE exams and is now studying Industrial Chemistry at Kenyatta University. From the outset, the Community had decided that the school should offer education to well qualified children – especially orphans – from the poorest families. During 2012, 173 children have been supported by bursaries. Why not consider sponsoring one or more of the 40 Form 1 children who will be awarded bursaries when they join the school in January 2013? Bursaries cost Euro 150 (£120, US$195) per year, or Euro 600 (£480, US$780) for the 4- year course. Friends who sponsor a named child for 4 years will receive annual progress reports from the secretary of the Bursary Committee. While the core facilities of the secondary school are now in place, there is a pressing need for a girls’ dormitory, given that over 90 girls are over-nighting in the classrooms. 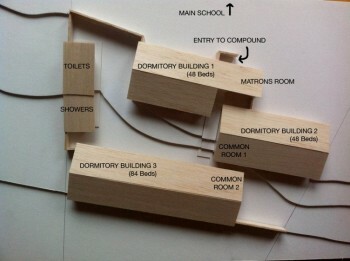 An attractive and ecologically benign design for the dormitory (picture left), which combines both sleeping and studying space, has been prepared by young female architects from the Australian NGO Bricks and Cartwheels (www.bricksandcartwheels.org). The capacity is for 180 girls. It will have a major impact on girls’ educational performance, by relieving them of the anxieties of walking to and from school in the dark and from engagement in household duties once they are at home. The first phase of construction, for 96 girls. will soon begin, with initial funding from Bricks and Cartwheels. Additional funds (about £20,000), however, will be needed to complete this. The local Department of Education is paying for the construction of on-site teachers’ houses, and the Constituency Development Fund will help to finance additional laboratories. When we first agreed with the Community on plans for the secondary school and appealed to friends for help in 2006, we had envisaged that it would offer practical skills training to pupils. This did not work out because there was no space in the curriculum for such classes. But the Community has remained determined to create vocational training opportunities for people in the area so as to broaden their employment opportunities and diversify the local economy. Some two years ago, thanks to a grant from The Besom, sewing and tailoring broadened to include woodwork, metalwork, nutrition and catering, and computer use. Courses are run by fully qualified trainers. Well over 100 people have received training and the demand for courses is strong. 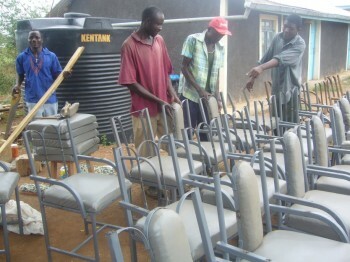 The photo shows metalwork and woodwork students making chairs for the Women’s Centre. The Community has, therefore, decided to formalise institutional arrangements, widen the range of courses on offer and build permanent facilities to replace the rented buildings now being used for most courses. The Ministry of Education has officially registered the Got Matar Institute of Technology (IoT) and will oversee the quality of training. The IoT will be run along private sector lines, with the income coming from fees and from the sale of goods and services expected to cover all operating costs. A site adjacent to the secondary school has been provided by the community. 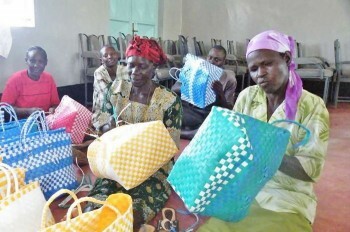 Here is a picture of a group of women who are supplementing their income by weaving plastic shopping baskets in the Women’s Centre, which forms part of the IoT. It is also used for computer training. Gyda, one of 2 Norwegian girls who spent 6 weeks teaching at Got Matar, as part of their “gap year”, is testing the market for these attractive baskets in Norway. The aim is to create a facility for 200 pupils, enrolled in up to 10 courses. Pupils will have the option of off-setting part of their tuition fees by working on the construction and furnishing of the Institute as well as of the girls’ dormitory. This will also provide them with valuable practical experience in a range of different building skills. The first phase of the building programme is planned to start in 2013, at a total cost of £210,000 (Euro 260,000). A prospectus on the IoT, which we are sharing with potential funding sources, will soon be available on the website (www.gotmatar.org). I am sure that some of you who receive this will, quite reasonably, say that we have achieved what we set out to do – and that’s enough! Indeed, it is fantastic to have built a secondary school for 600 children in just four years and to see it performing well. The aim now must be to keep it open to bright children, especially girls, from poor families, by extending the bursary programme, and to continue closing the performance gap between it and the best schools in the District. The proposed creation of purpose-built facilities for the Institute of Technology will fill a big gap in the local educational system. It is of special relevance to a rural population in which the normal inter-generational transfer of skills within families has been cut by the AIDS epidemic. All royalties from a little book that I have written with Ignacio Trueba, entitled “How to End Hunger in Times of Crises – Let’s start now!” are being donated to Got Matar. It is available as an e-book from Kindle and should soon be on sale as a paperback in English, Spanish and Italian from Amazon.